Inertia (i-nûr sh ) n. A law of physics states that “an object at rest tends to remain at rest, and an object in motion tends to remain in motion.” Scientists call these tendencies inertia. Inertia is a way of measuring how hard it is to change the momentum of an object, whether that’s getting it to speed up or getting it to slow down. That depends on how much mass the object has. Big heavy things (things with a lot of mass) have more inertia than light things. You have to push a bus harder than a scooter to get it to move. 13oz of make my bike easier to ride. If something has a lot of mass, it’s also hard to get it to stop moving. Because the bus has more mass than the scooter, it would be a lot harder to stop the bus. If the bus was moving fast, you’d need good brakes to get it to stop. That’s also inertia – inertia’s a way of measuring how hard it is to get something to stop moving, too. There are three laws proposed by Sir Isaac Newton concerning the relation between force, motion, acceleration, mass, and inertia. These laws form the basis of classical mechanics and were elemental in solidifying the concepts of force, mass, and inertia. Newton’s first law states that a body at rest will remain at rest, and a body in motion will remain in motion with a constant velocity, unless acted upon by a force. This law is also called the law of inertia. Newton’s second law states that a force acting on a body is equal to the acceleration of that body times its mass. Expressed mathematically, F = ma, where F is the force in Newtons, m is the mass of the body in kilograms, and a is the acceleration in meters per second. Newton’s third law states that for every action there is an equal and opposite reaction. Thus, if one body exerts a force F on a second body, the first body also undergoes a force of the same strength but in the opposite direction. This law lies behind the design of rocket propulsion, in which matter forced out of a burner at high speeds creates an equal force driving the rocket forward. 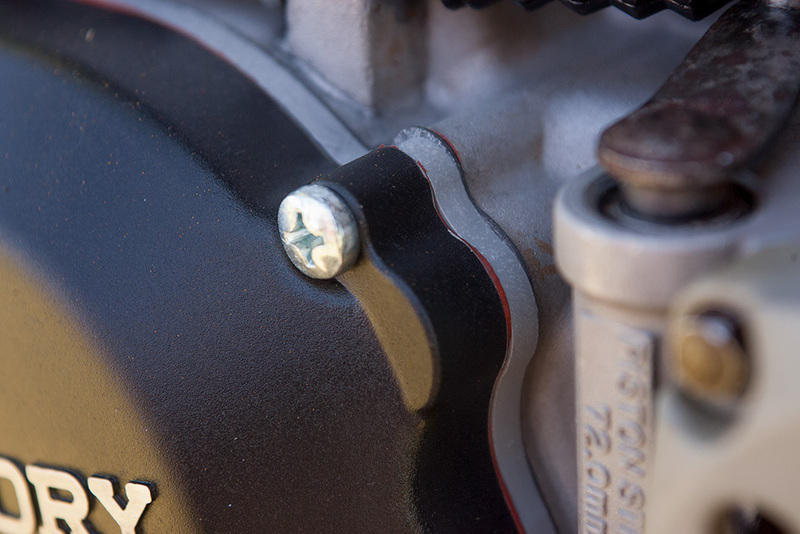 It’s a lot to wrap your head around, we know, but all of this jibber jabber helps to explain what is going on at the end of the crank on your engine when you rev it. Less weight on the crank requires less effort to spin equaling quicker revving, more weight requires more effort to move which equals slower revving. Two stroke engines, on MX dirt bikes, typically ship from the factory with little to no weight on their stator. This is why a 2t revs so quickly. A fast revving engine sounds great when you are warming the bike in the pit area. However, that same fast rev translates to fast, or perhaps a better word for this conversation, sudden access to your engine’s peak power. 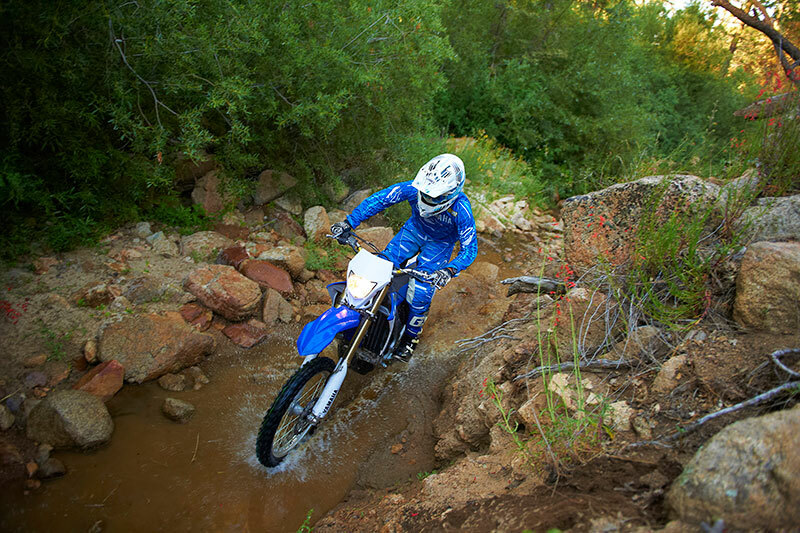 Access to peak power on a 250 2 stroke MX bike is an exciting experience especially when going in a straight line in a wide open riding area or track with excellent traction. Things change quite a bit if you are riding in tight woods or on a track where traction is low and you need access to usable power not explosive power. The question is what can you do to tame the power delivery without giving up the peak power? 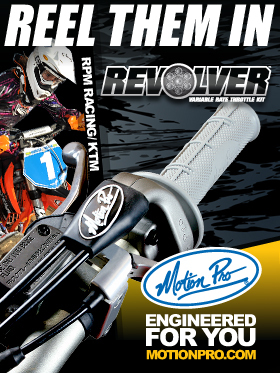 You can modify the port timing and tune the motor to your style of riding. This options works but is costly and limits your motor to one power band or you could say hello to Steahly Off-Road. These guys make a series of flywheel weights that bolt onto the end of your engine’s crank in less time than it takes to put your boots on that cost far less than motor work. 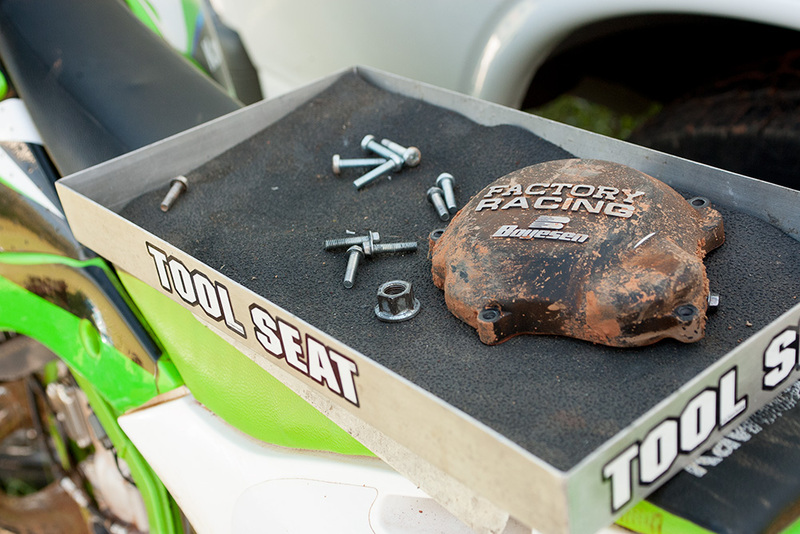 The weights Steahly offers for our 2000 KX250 vary in size from 7oz to 13oz with 9oz and 11oz options in between. We took one of each with us recently for some testing to see what we thought. The conditions ranged from tight wooded trails on packed dirt and rock to a turn track with loosely tilled, dry North Carolina soil (basically broken up bits of hard red clay, not unlike concrete). In both scenarios traction was not ideal. These weights attach to your existing flywheel. The white thing goes into the spark plug hole to keep the engine from turning over during flywheel installation and removal. In order to get a good sense for the bike and the conditions we rode the KX for 30 minutes getting a feel for the motor without any extra weight on the flywheel. On the trails we had to blip the throttle constantly to keep the motor in the torque range. When the trails became tight and technical we were constantly slipping the clutch. When on the turn track enthusiastic throttle use had to be kept to a minimum to keep the rear wheel from spinning. For our first try with the flywheel weights we installed to 7oz unit, the difference was amazing! We could hardly tell it was there as we revved the bike in the pits but noticed instantly when riding from a stop toward the trail entrance. Suddenly the KX had more bottom end and didn’t require such high rpm’s to get rolling. On the trails we still had to keep the engine revving and a finger on the clutch to keep from stalling if rpm’s dropped too low. The turn track was a different place all together. An off camber, downhill turn that was causing serious wheel spin felt more manageable with the added low end torque. 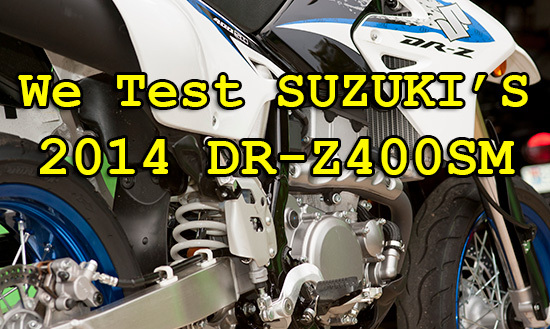 What was amazing was there was no perceivable different in throttle response with the 7oz weight. The gray spacer between the side cover and the motor is supplied with each Steahly flywheel kit kit when necessary. What would the 13oz feel like? It felt like a tractor! It gave the impression that the KX now developed torque from idle and yet it still revved to the moon. It was a very strange sensation to rev the KX and have it come up so slowly. It was even stranger to close the throttle and have the rpm’s come down so slowly while we were still in the pit area. Riding was a whole new ball of wax and actually required some getting used to. The KX still made heaps of power with the 13oz flywheel it just came on and off so gently. When riding out of the pit area the bottom end made so much torque that we hardly needed to open the throttle or slip the clutch. The KX just chugged off, very much like a 4t would. Riding on the turn track the motor would almost stay on when we closed the throttle which was weird. It was extremely odd and required a different style of riding from the typical point and blast it style that is standard for a 2t. After a few laps we did however found ourselves carrying more corner speed with the 13oz unit but did this with less effort. On the trails the 13oz was nothing short of brilliant! We still found a finger on the clutch lever but that was more out of habit than necessity. It felt like nothing we could do would get the motor to stop running. 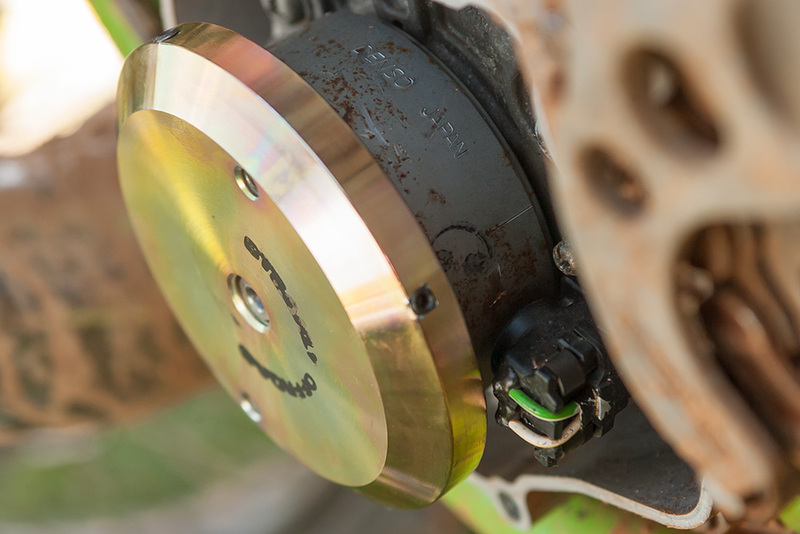 The 13oz flywheel kept the KX motor chugging along at the slowest of speeds. Gone completely were the constant blips at the throttle to keep the engine in the torque range. With the Steahly flywheel weight the KX was supper torquey which made riding nasty sections a treat. With the 13oz weight, wheel spin was all but gone, even in the slickest conditions. The only drawback was the strange feeling coming off high rpm’s on the track. 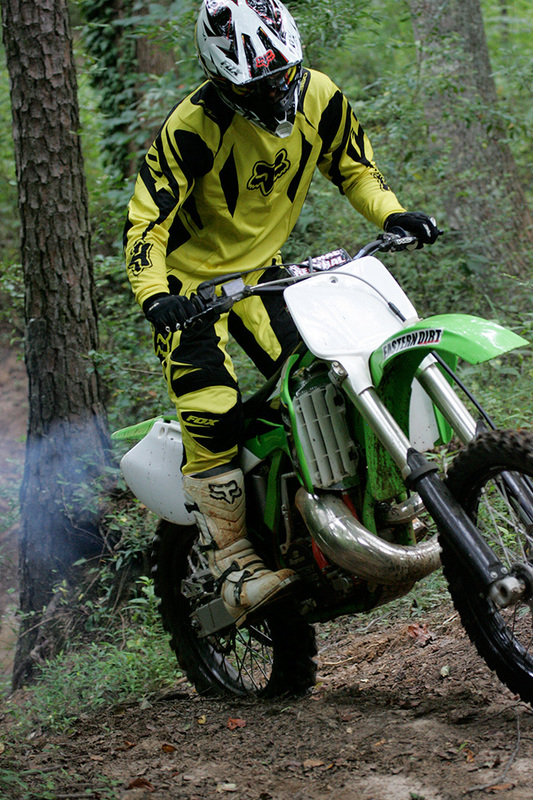 Less wheel spin makes the KX far easier to ride in tricky situations. If you are riding both trails and track with an emphasis on trails we suggest using the 11oz weight. 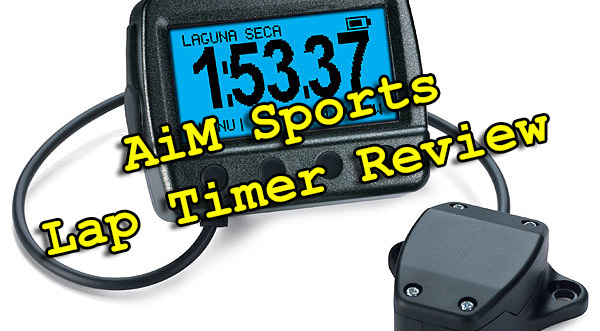 If you are riding trails and track with an emphasis on track, go with the 9oz. For track only go with the 7oz or for slick conditions use the 9oz. For trails only the 13oz is a fantastic choice and the 11oz feels just as good without so much of the rev-on effect. Whatever type of riding you do these flywheel weights will improve your experience making it easier to ride longer with less fatigue. 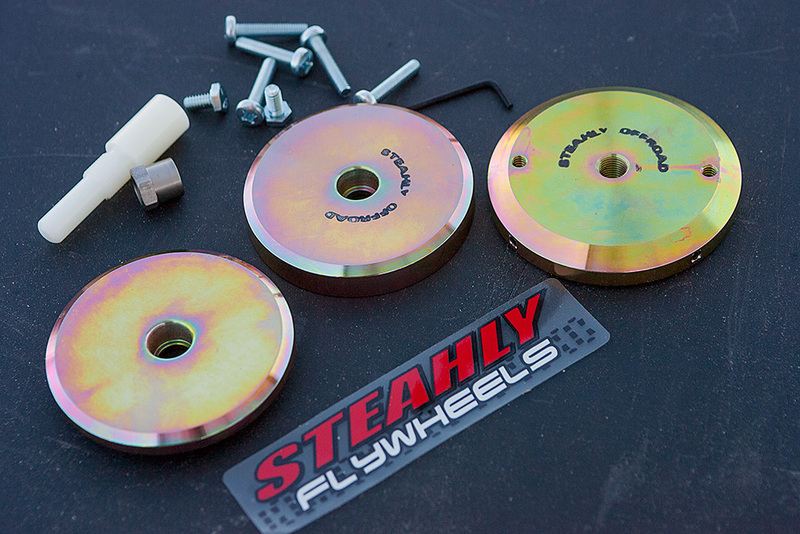 As far as we can tell the Steahly Off Road flywheel weight is one of the best upgrades you can make to your bike and should be one of the first you make.